I like it! Thanks for passing along that idea, Jumiclads. I think it's a GREAT idea too...and I'm nearly falling off my chair with giggles at the visual in my head of one of our gardeners who likes to be out before dawn!!! Well I think Camprn has answered that question well enough. LOL, I'm all about visual learning. Great idea, I love it ! Well, I did it! I just ordered the Scarecrow Motion Activated Sprinkler...should arrive by the end of next week. I can hardly wait to set it up and see what happens! Oooooohhhh, I've got the giggliest giggles going on right now just thinking of what might happen!!! I'm really hoping there will be some way to attach a timer to the battery so we can have it turn on and off at dusk and dawn. Maybe I'll have to invest in a water timer and attach that to the hose that will attach to the Scarecrow. Hmmm, this could get complicated! OK all you engineers out there...help me out here and I promise I'll post pics of the funnies that are sure to happen in the garden! we started building the greenhouse! 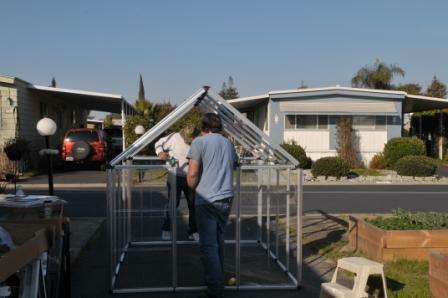 Yesterday morning we started building our greenhouse! Finally!! We had sunshine (almost blinded us!) all day and the temp got up to 59...Yahooie! 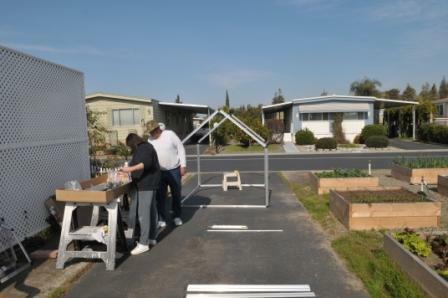 Our neighbor and fellow gardener Ralph helped out all day and I'll tell you ... even with the VERY detailed instructions for building this 6' x 8' Snap & Grow kit from Home Depot...it still took us until 4pm to get the frames put together and some of the window panels in place. Well, almost 2 hours was sorting and inventorying the jillions of parts! 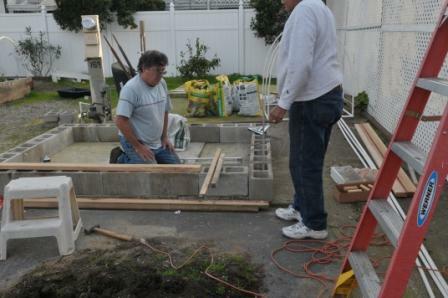 Then we had neighbors stopping by off and on asking if we were building a "dog house" for Al!! After the inventory we realized we had a broken part so I called the maker of the greenhouse (Palram in PA) to discuss the broken part and a few missing screws (which they are shipping immediately, FREE!) and Frank, the really nice guy on the phone said to take it one step at a time, don't skip steps, working on it kinda like building with Legos. I know how to do that...with 3 small grandsons I know all about those Legos! I'll post pics this evening after we complete (?) the greenhouse today. Well, as complete as we can until we receive the replacement part. The first couple of hours we spent doing inventory. The boxes are filled with all the jillion parts! The work finally begins. That rubber mallet was pretty handy! Some of the parts were hard to find, even with our carefully sorted baggies! This is hard work! One of those parts fell and hit me in the face...ouch! Two hours later...you can see the shadows on the ground...we're tired! We decided to quit for the day. It was 4:30pm and we had started just before 10am with one very short lunch break. We were all getting a bit grouchy and it was time to stop and regroup in the morning. Some of the panels are in place, others just refuse to slide in the grooves. By shimming under the bottom frame we can make them work. The key is to work on a level surface! Friday, 03 Feb 2011...here we go again! 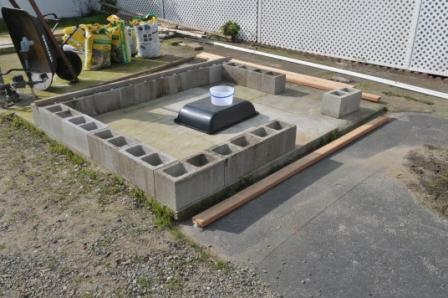 Because the side walls of the Greenhouse are so short, and we have some tall gardeners, we decided to make a foundation. After a short discussion Ralph said he knew of some blocks available. A quick check with Management and we were on our way! 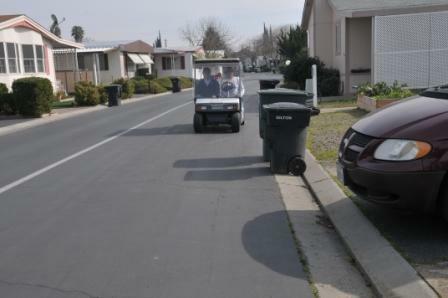 Ralph used his fun golf cart (many of the residents here in our park have these to use in the park instead of wasting gas in our cars) and he and Al made a few trips collecting the blocks needed for the foundation. 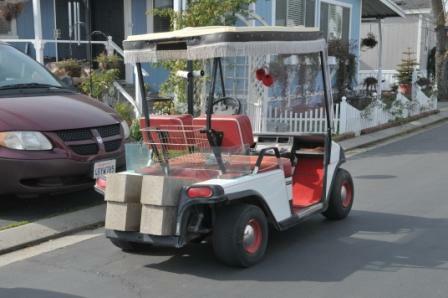 Ralph's golf cart, with the cute fuzzy dice, got a work out hauling these blocks! ...and so did Al and Ralph! ...and of course the existing pad is not level! Stress sets in as the concrete sets up! This is very rapid drying stuff! Al is still worried but it's 5pm and time to stop for the day, a very long day! That was the end of the second day. 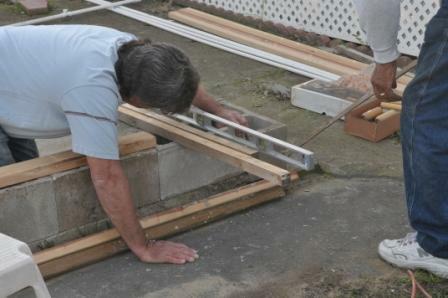 This morning Al and Ralph are out there making frames to hold the blocks and concrete in place. The foundation will be fine, I have no doubt about that...but what a hassle working on stuff that other people did wrong in the first place! Why in the world the previous owners of this lot would have poured pads for sheds that were that far off...we just don't know! A few more details about that block foundation. 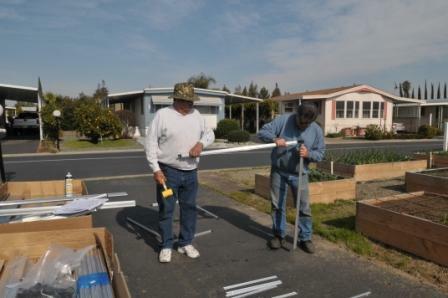 Al and Ralph made a trip to Home Depot for the concrete, some rebar, and some L-bolts. They drilled into the existing pad and pounded some short pieces of the re-bar into those holes which were inside the openings of the blocks...this pinned the blocks in place. The guys then poured some concrete into the holes to keep everything together. At about every 6th opening in the blocks a bolt was held in place as the guys poured concrete into that hole too. This L-bolt will be used to come up through the 2x6 wood plank that will cover the tops of the blocks. 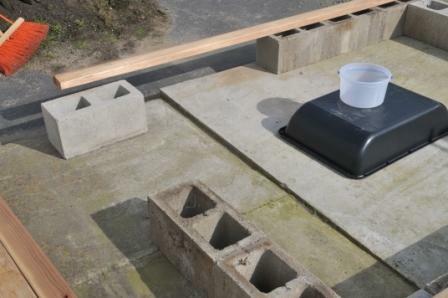 This will keep stuff from falling into the holes and block much of the air coming in through the blocks. The wood will be our anchor when the bottom frame of the greenhouse is attached. 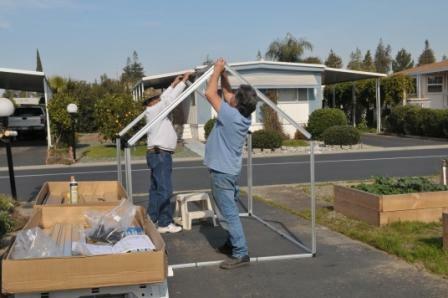 Yes, a whole lot more complicated method than just setting the greenhouse frame on the ground, but this will prevent any lifting with winds, and allow for our taller gardeners to work easily. I'm tired from just reading this!!! WHEW. Hello there! I'm new to SFG and am starting my garden this year. I have grown a garden before...just not a Square foot one. I was thrilled to find a local square foot gardener. Your plots look wonderful and Wohoo! on the green house!!! I wanted to ask, is it to early to start my seeds? Or am I too late on some. I did plant some potatoes last week. Is there another really good veggie I should try? I'm open to try new and unusual veggies. 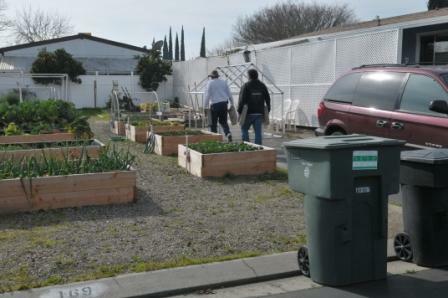 Also, if you're in the Modesto area please feel free to come on by and see our gorgeous Apollo Garden! 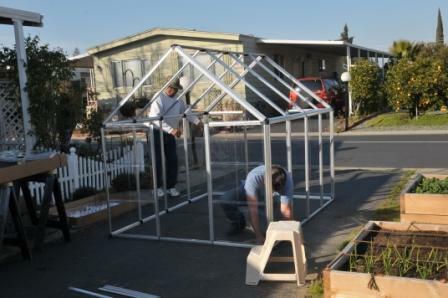 The greenhouse is almost finished and the gardeners are anxious to start using it. PM me for the exact address. @FarmerValerie wrote: I'm tired from just reading this!!! WHEW. ...yeah, we're tired tonight too. Al and I were putting the last panels in the greenhouse as some of our neighbors walked by and commented on how much time we spend out there in the garden. Yes we do!! We love it, but yes, we're sure tired by the time the sun goes down! How many more days until ???? @mrsfish94 wrote: Can you believe our weather today? I LOVE the weather we're having but it looks like a new set of storms coming in next week...at least we'll get the rain we need! Right after we set the greenhouse down on the foundation and bolted it to the planks, the wind started. We had really tough gusts through the night and at one point I kept insisting Al go out and check. He's such a sweetheart...after midnight, in his pj's and slippers he went out to check...yep, it was still standing and OK. Whew! I had visions of the panels blown over the fence to the neighbor's yard. 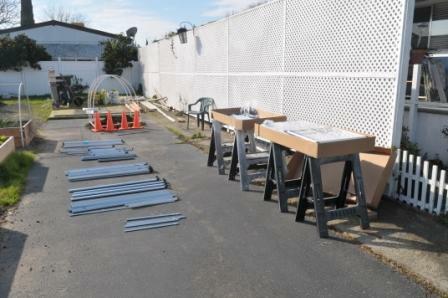 Now to get the shelves built and installed and we can start seedlings! working on my garden today! I am so glad your green house didn't fall over...LOL!!! That would be very disappointing. I have been out in the garden today. I have a 16 foot by 7 foot flower bed that I'm turning into my SFG. It's going to have (3) 4X4 planters and (3) 2X4 planters. I got half done today...and plan to finish the rest tomorrow. I want to get it done before the rain comes. I'm using pavers to separate the areas. When I'm done I'll post before and after photos. As for seedlings, they are on a folding table in my living room. I take the trays outside during the day and bring them in at night. I have beet seedlings, a few turnips, one Romaine lettuce and a few of my tomatoes are coming up. Do you think it's too late for broccoli? I am so exhausted. I hand tilled the rest of the flower bed and put down the pavers. My legs and hands hurt. As promised here are my before and afters. Looks gorgeous. Can't wait to see the boxes. I wasn't going to make raised boxes. I was just going to plant straight in the ground. I know boxes are better. But, the light hits the back wall of our house and really warms up our soil. (it's completely south facing) Especially, in the summer. I figured I've give this a try...If it doesn't work...I'll make raised boxes next year. Are you going to use mel's mix or any other improved soil? One of the beauties of the raised bed and MM is the wonderful looseness of it. The main thing is once the soil is loose not to walk on it but you seem to have that covered. Good luck. Oh yes! I did add an organic soil amendment before I tilled the ground. I plan on adding something more to the top before I add my seedlings/seeds. Something to keep it from drying out so fast because of all the reflected heat. I used a weed block on my garden last year and it kept my garden soil moist. But I can't really use that with SFG. Or can I? It's raining...it's windy... I just planted my Heirloom Tomatoes...and I pray they are going to make it. I'm ready for our spring!